Get ready for an unbelievable show, RnB fans!! 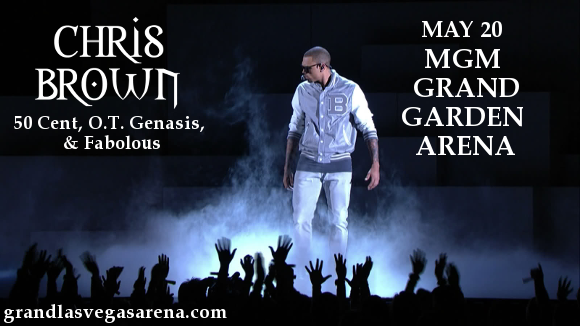 Chris Brown is on a MASSIVE tour with the colossal 50 Cent, OT Genasis, Fabolous, and Kap G! These 5 huge artists are headed to the MGM Grand Garden Arena on Saturday 20th May 2017. Grab your tickets now for one of the hottest shows of the year – but hurry, they won’t last long!!! Born Christopher Maurice Brown in Tappahanock, Virginia, Chris Brown’s musical abilities started to develop at an early age. He sang in his local church choir as a child, taking an interest in the rising RnB scene as a teenager. Relocating to New York as an adult, he found himself scouted by Tina Davis, an A&R executive for Jive Records, whose roster includes the likes of Britney Spears and Justin Timberlake!! He was signed to the label in 2004 and in 2005, released his first, eponymous album. It was a huge success, shooting to the top of the charts, selling over 3 million copies worldwide, and earning Chris Brown the first two in a series of Grammy nominations that would continue through the rest of his career; Best New Artist and Best Contemporary R&B Album. Since then, Chris Brown’s career soared, decimating the charts with one smash hit album and single after another! His skills as a dancer and choreographer give him that extra edge over other RnB singers, and make his live show a truly thrilling experience. What are you waiting for?? Get your tickets to see Chris Brown TODAY!! !